Did you all have a restful Thanksgiving weekend? For the first time in 20 years of living on my own we had a traditional dinner for Thanksgiving. Youngest child expressed concern that he would never, ever know what a real turkey tasted like. 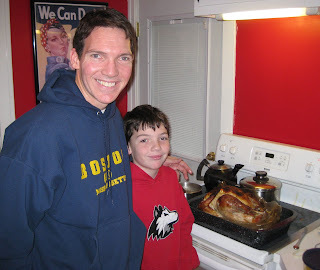 My husband took over the oven and cooked them a bird. It was gross and I didn't enjoy any minute of dinner but now they can't say we never made an effort to give them a "normal" Thanksgiving dinner. Husband and I stayed up all night after dinner and started our Christmas shopping at 2:30am. We were finished by 7am and found some really good deals(at least 50% off) on items we needed. 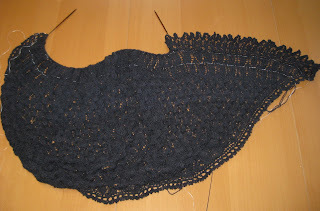 In my knitting world the current shawl in progress is inching along at turtle speed. The edging instructions involves an 8 row repeat 114 times. I'm about halfway through the edging and hope to finish it up by New Year's Eve. On Saturday I went to pick out a "new to me" fiddle(on the right). I went with a specific color and make in mind(a nice dark reddish brown and German made)but I ended up not finding exactly what I wanted. I am going to borrow this one for a few months. 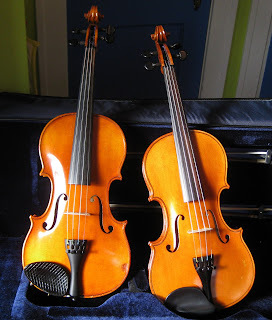 It ended up looking very similar to my violin(on the left) but the sound is very different. I love the warm sound this one produces. I'm looking forward to gathering in front of the fireplace and playing lots of festive tunes during December. 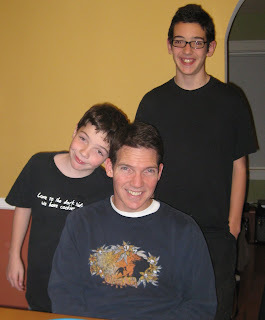 for my three crazy guys. We can call every crafting adventure an art class here at our house of homeschooling. 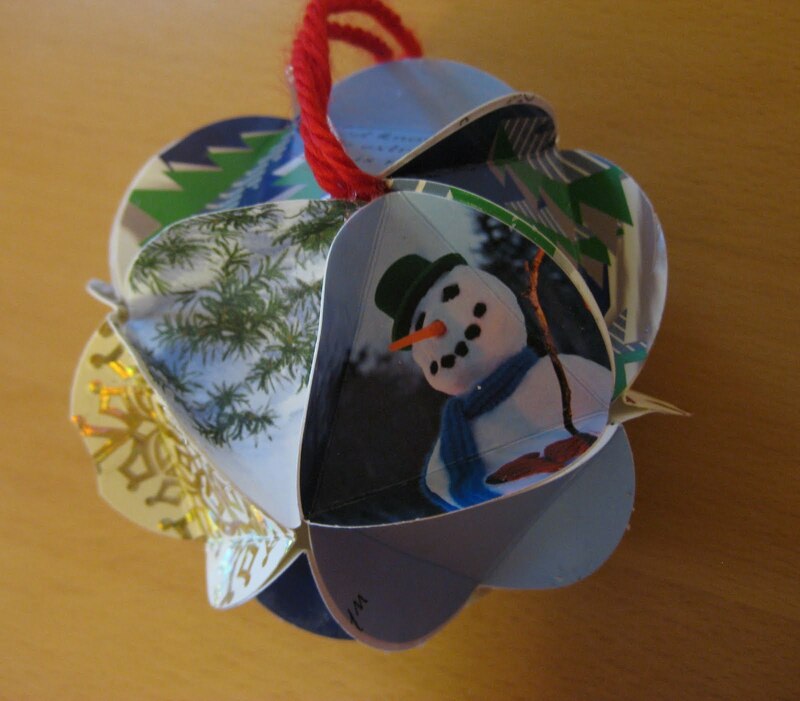 The past couple of days we've been busy making ornaments for a tree at a local museum. 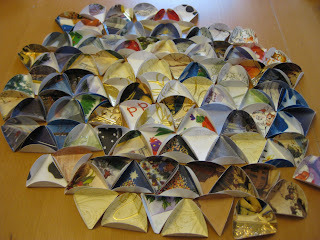 A knitting friend passed along some recycled cards and instructions. We were able to glue together 8 ornaments from all the cards. We also made about 3 dozen dough ornaments. 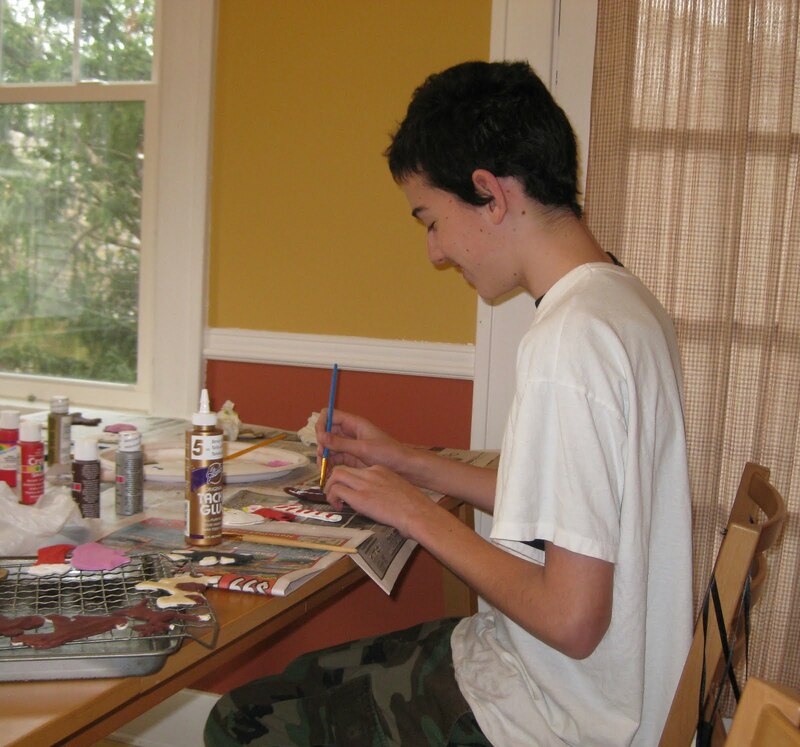 Hey, anything that can bring a smile to the teen is a winner of a project to me. 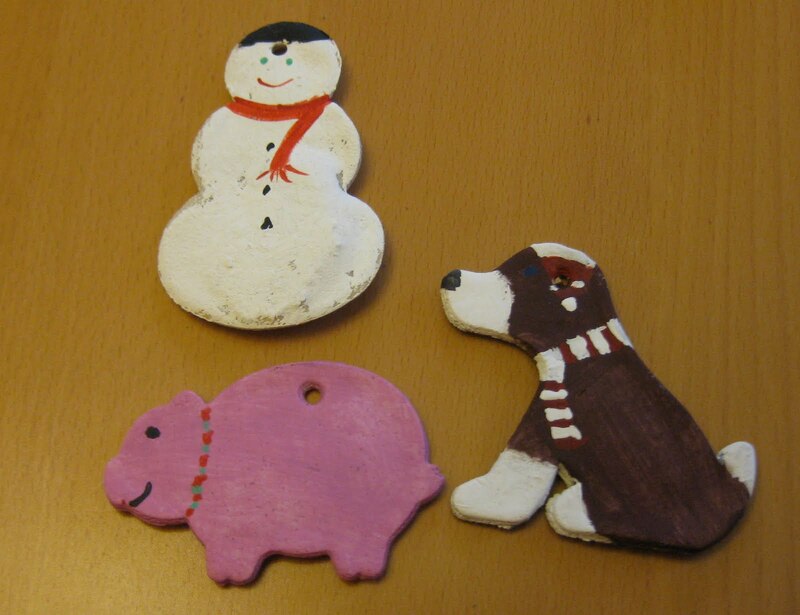 Of course my favorite ornaments they painted were wearing hand knits. I delivered my first Christmas gift yesterday. 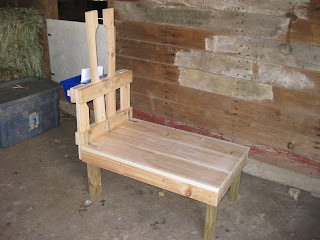 It's been 20 years since I've made anything with tools other than knitting needles and a sewing machine. With help from some awesome online plans I was able to build this in a couple of hours. I think it took me longer to gather the supplies and materials than it did to put it all together. Mama goat, Callie, is due in March so this present arrived in plenty of time. I packaged up my first box for Halos of Hope charity this morning. 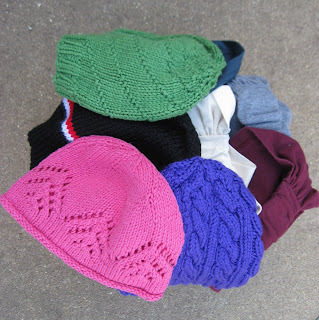 I was able to knit 5 hats and sew up 4 bandannas. It feels good to have two gifts finished before Thanksgiving. This morning was Science experiment time. We were learning about one of the properties of Boron by making floam. 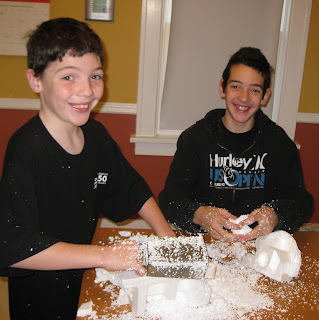 It started out a little messing with the grating of Styrofoam. This stuff sticks to EVERYTHING, including dog whiskers! 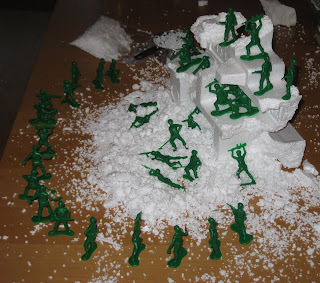 Of course they just had to create a "scene" with army men before all the foam disappeared. 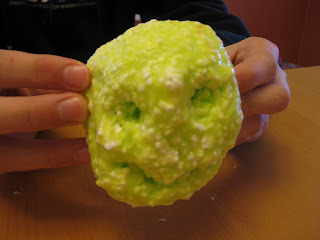 After mixing up our concoction we ended up with a couple globs of floam. It was a bit messy but having both kids get along for 30 minutes was worth the mess. 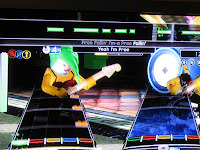 I picked up the Lego Rockband game tonight. It's a ton of fun and we get to play 45 new songs. And I get to have green hair! Last week was filled with Fall activities. I hate crowds so we skipped the big Pumpkinfest last weekend but still went to see the display of pumpkins after the fest was over. We traveled down the road to view the pumpkins on the courthouse lawn on Tuesday. 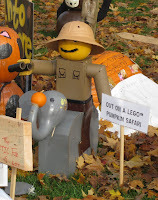 My favorite was a Lego themed pumpkin. 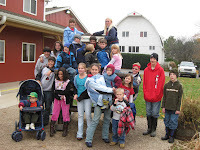 On Wednesday we gathered with a group of home schooling friends at the orchard for a mud filled corn maze. 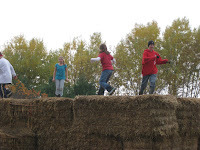 The kids didn't care so much about the maze but loved playing tag on top of the huge hay bales. 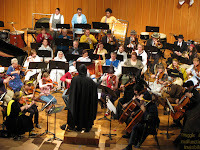 On Friday I took the kids to a special Halloween concert. They aren't huge fans of classical music and would rather play metal on Rockband but they loved the concert. Especially Vader conducting the Imperial March with his light saber. and time for dressing like a soldier(at least the kids did). 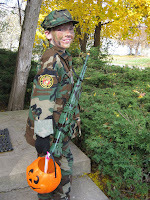 Thanks to a local Army Surplus store this was the cheapest Halloween yet. The kids were excited to get authentic hats/clothes/patches and even their own dog tags. Add to all that a full week of school and it's no wonder why I was so tired yesterday. 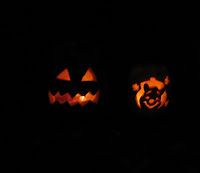 I hope you all had a great Halloween weekend too!